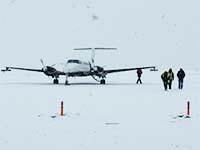 A University of Wyoming researcher contributed to a paper that demonstrated, for the first time, direct observation of cloud seeding-- from the growth of the ice crystals through the processes that occur in the clouds to the eventual fallout of the ice crystals that become snow--and how the impacts could be quantified. The research, dubbed SNOWIE (Seeded and Natural Orographic Wintertime Clouds -- the Idaho Experiment), took place Jan. 7-March 17, 2017, within and near the Payette Basin, located approximately 50 miles north of Boise, Idaho. The research was in concert with Boise-based Idaho Power Co., which provides a good share of its electrical power through hydroelectric dams. While a good deal of research took place aboard the King Air, much of it also occurred on the ground. Numerical modeling of precipitation measurements was conducted using the supercomputer, nicknamed Cheyenne, at the NCAR-Wyoming Supercomputing Center. The numerical models simulated clouds and snow precipitation -- created in natural storms and with cloud seeding -- over the Payette Basin in Boise. The numerical models also allow researchers to study future storm events where measurements have not been obtained in the field.